Spotted this insect resting on the shell of a large Sulcata tortoise. Tortoise was walking around but insect stayed on long enough for me to get a camera and take a shot. Area has native oak and pine trees. 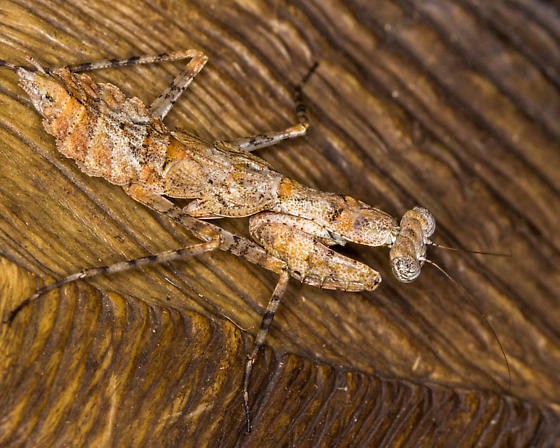 Maybe a female Grizzled Mantid? By the way, that's a beautiful photograph! That ID works for me. I Googled in Gonstista grisea and came up with this key: http://entnemdept.ifas.ufl.edu/choate/mantid_key1_03.pdf which appears to confirm the ID. Thanks for the ID and kind words about the image. I've downloaded it and added it to my files. Much appreciated!